Regarding the motu proprio and the lifting of the excommunications, and the discussions with Rome, is there hope? There is definitively hope! I may say, in Christian life there is always hope! It’s one of the three theological virtues that is really what moves the Christian to strive towards Heaven. Every soul is organizing its life because of Heaven, with the hope of reaching Heaven; and if you look at the crisis of the Church, if you look at all these happenings of these last years, it goes all in the same direction, that is, in the midst of a very hard time, in the middle of a lot of controversies and contradictions, there are still some good sides which really tell us we are going ahead, and these, like the motu proprio on the Mass, like the decree about the excommunications, like the discussions, they all go and take the same line, which is an improvement towards Tradition. The Church is starting to throw a glance towards its own Tradition. That’s hope! Regarding the reactions of the bishops to the motu proprio, are the bishops abusing? I think many of them are. This motu proprio clearly states the right, establishes the right of every priest to just say the Tridentine Mass; and the same for the faithful. If you look at the way the bishops behave, many of them require that permission be requested, an undue permission because the priest does not need that permission; and so, there you have an abuse. But even if you look more concretely, they push, they threaten, they treat badly those who want Tradition; and that is a very clear abuse. Do you see the situation as being the same throughout the world? This situation, yes, is about the same in the whole world. You may find, here and there, in some countries, some bishops who will be more lenient, who will be following more the orders from the Holy Father, from the pope. There are few of them. So, you may find some and we could list a certain number of them who really open the doors to the Tridentine Mass but the great majority don’t, and this is true for the whole world. Does the Mass bring doctrine? 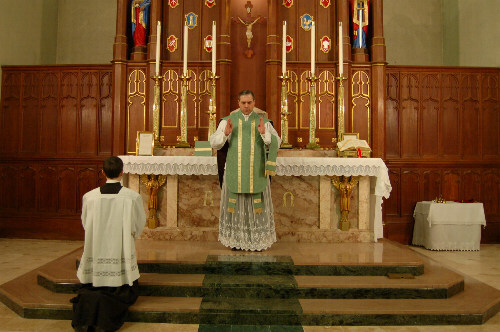 It’s something amazing about the Tridentine Mass: it is so well done, and it is so full of the Catholic faith that it does not only nourish the faith, but this very nourishment of faith produces inside a need for it, a need for true doctrine. 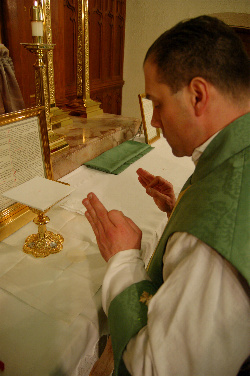 I am amazed to see how many priests, who just came, let us say, from the Novus Ordo, who themselves tell us they didn’t get much during the seminary, who feel the same attraction to go back to doctrine, back to theology, to open the books, to open the Summa of St. Thomas, and to learn there what they didn’t get at the seminary, or maybe to correct what they were taught. And it’s so general that I think we can make out of it a real law and say: whoever, with a humble heart, with a sincere heart, touches the Mass will, sooner or later, touch theology.